Handmade Detroit | This Sunday is Social Circle in Ferndale! This Sunday is Social Circle in Ferndale! Don’t forget! 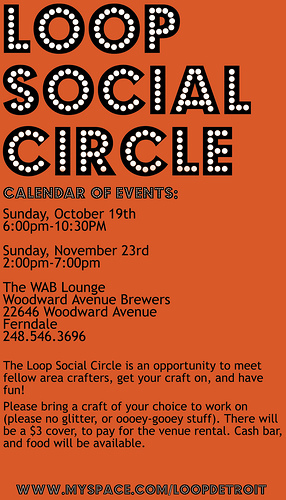 This Sunday is Loop’s Social Circle at the Woodward Avenue Brewers in Ferndale. It’s downstairs in the WAB and we’d love for you to join us. Bring a craft and your friends. This event is for all makers and is a great way to get more involved with Detroit’s crafting community.